The Mt. Morris Dam is located at the north end of Letchworth Park. Built between 1948 and 1952 at a cost of $25,000,000; it is said to be the largest concrete dam east of the Mississippi River. 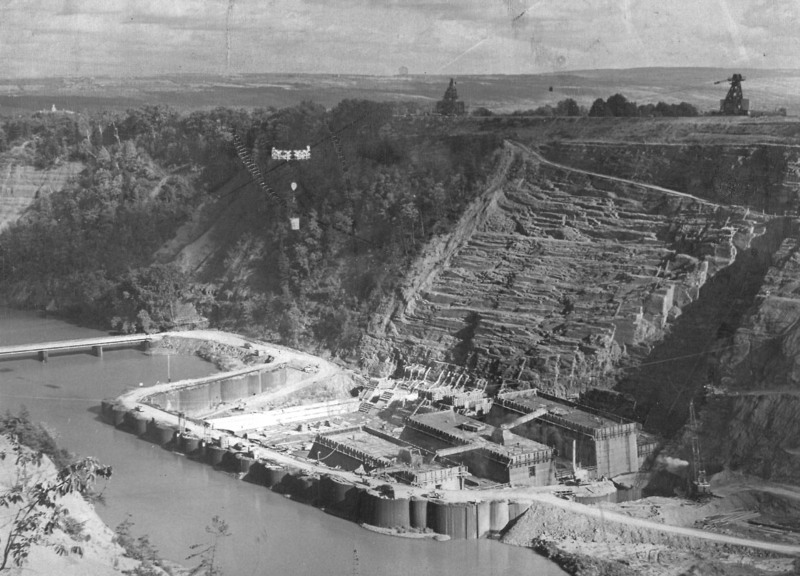 The image below was taken during the construction of the Dam. It is taken from a spot northwest of the Dam, looking southwest. Coffer dams have been built to allow the work to begin near the eastern bank. Six sections of the dam have started to rise from river bed- also note the excavation work that has been done on the gorge wall in preparation for the dam. For more information on the Mt. Morris Dam, we suggest you stop by the Dam's Visitor Center or go to the official website of the Army Corp of Engineers - the link for the Mt Morris Dam web page is found in our links!